Jul 03, 2018 • by UGI, Inc.
• Drink plenty of water or other non -alcoholic fluids even if you don’t feel thirsty. Avoid coffee and tea because they contain caffeine, which increases water loss. Alcoholic drinks also dehydrate. Soda and fruit juices contain more sugar than needed, so they aren’t absorbed as easily or quickly as water or commercial sports drinks. Eat frequent small, lower protein meals (fruits, vegetables & salads). • Wear lightweight, loose-fitting, light-colored clothing. Change clothing if it gets saturated. Wear a hat and apply sunscreen to exposed areas when outside. • Check on the elderly, infants, young children and people with chronic health problems or disabilities. They are more vulnerable to the effects of heat. 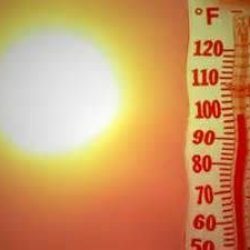 • Keep pets indoors or provide them with shade and plenty of cool water. Refill their water bowls frequently. Do not leave pets in a closed, parked vehicle. • Stay indoors, if possible. If air conditioning is not available, stay on the lowest floor, out of the sun. Do not spend long periods of time in the direct sun. • If possible, work or play in the cooler hours of the day. Using Energy Wisely – UGI also encourages residents to use energy wisely this summer. Here are some easy and inexpensive conservation tips. • Install a programmable thermostat and raise the setting to the highest comfortable temperature. You can save three-to-five percent on your air conditioning costs for each degree you raise the thermostat. • Close doors leading to uncooled parts of your home. If you have central air conditioning, close off vents to unused rooms. Keep filters clean. • Even if you have air conditioning, use ceiling fans to provide additional cooling and better circulation. • Seal holes and cracks around doors and windows. Eliminate air leaks around window air conditioners with foam insulation or weather-stripping. • Close blinds, shades and draperies facing the sun to keep out the sun’s heat and help fans and air conditioners cool more efficiently. • Use timers and motion detectors on indoor and outdoor lighting. • Avoid placing lamps or TV sets near your room air-conditioning thermostat. The thermostat senses heat from these appliances, which can cause the air conditioner to run longer than necessary. • Vacuum registers regularly to remove any dust buildup. Ensure that furniture and other objects are not blocking the airflow through your registers. • Install efficient lighting that runs cooler. Only about 10 to 15 percent of the electricity that incandescent lights consume results in light—the rest is turned into heat. UGI Utilities is a natural gas and electric utility with headquarters in Reading, Pennsylvania. UGI serves 700,000 customers in 45 Pennsylvania counties and one county in Maryland. Customers and community members are invited to visit the UGI website at www.ugi.com, our Facebook page at www.facebook.com/ugiutilities; or follow us on Twitter at www.twitter.com/ugi_utilities.